We’ve made it to Thursday – the day we talk about our Infinity Customers! The thing I wanted to chat about is there are two sides to our Infinity Customers… side one is the buying side and side two is the nurturing side. These are very different sides. Let’s look at the benefits of the two sides. If we operated under the “One and Done” style of business that we have traditionally grown up with we would create an ad. It’s focus would be on that product or service we sell. People would buy and we would look for more customers. Clearly, we still need to do advertising, but… there is a new way. The new way is when we create our Infinity Marketing Machine and get ready for new customers to join us on a journey. We find them (or they find us) and they enter our machine. This machine is geared to make them want to stay. Sure they found us with an intent to buy something… but after they buy, they don’t leave. Sure, we used to keep a “mailing list” and when we wanted to sell something we would create a letter or postcard and send to the customers… but now we entertain them. At the heart of it, we are creating a tribe. The tribe stays. I look at how we did business 20 years ago, we kept (and still keep) a mailing list. Our customers rent boats, and at the beginning of the next season we would send a invite to come out and enjoy the lake… by renting a boat. This model will still work. All winter long, once a week, our customers receive an email from us. Each week we talk about what is going on around the marina and in the area. We share our vibe. By the time the spring comes, they’ve already seen us working on the motors, cleaning the interiors, launching in the lake, watching the ice melt, and hiring new crew. We really have no reason to send a postcard to welcome to the lake, they’ve lived the experience, in real time, as it has happened. This is the nurturing side. As for the buying side… well, that happens when they rent a boat. We do still have traditional advertising which generates business, BUT… again, we switched our focus to capture leads instead of the “one and done” cash register ring. It’s VERY scary to make the jump. We are getting ever so close to our 60th year of business, and to leave everything you’ve known about “one and done” in exchange for “infinity” is scary. Here’s the funny thing, I didn’t send out that “welcome” letter in the summer of 2018. It didn’t even occur to me, I noticed I didn’t send it about a week ago… and you know what, we INCREASED sales in our rentals last summer. Infinity works. It IS well worth it, IF you are willing to commit to the 5 C’s… Character, Content, Consistency, Customers, Cash. When you fully Commit, it works. hahaha – That’s the hidden C… Commit. Therefore, if you commit to the continuous nurturing of your tribe building the buying side will take care of itself! 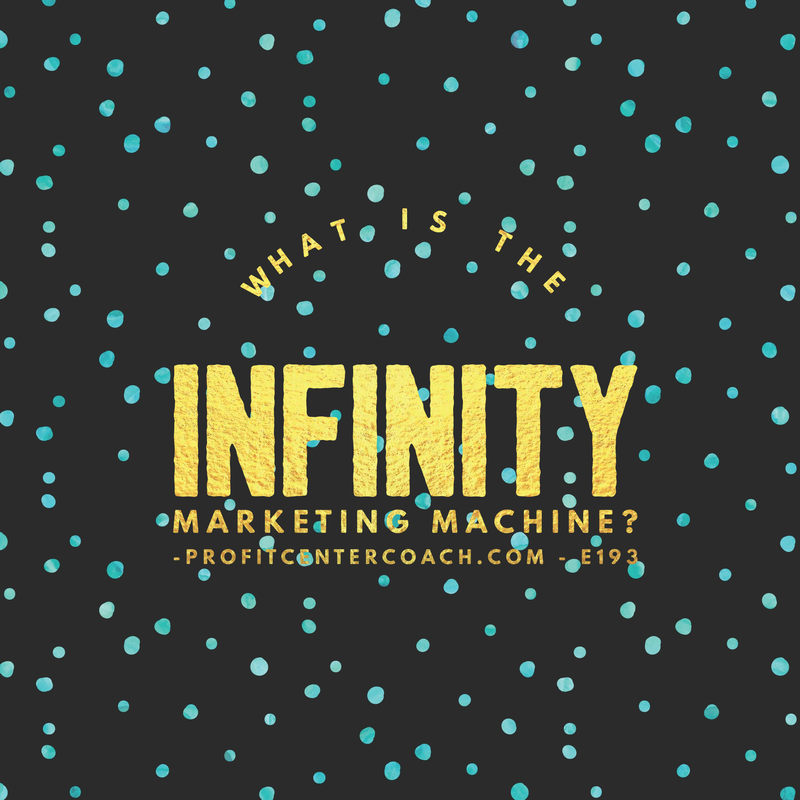 Episode #193 – What is the Infinity Marketing Machine? What is the Internet Marketing Machine? It’s your ability to connect with your customers on your terms. You build a bond by creating information customers want to receive and in turn they offer their information so you can continue to market to them. It’s a “win win” relationship that turns a customer from “one and done “ to an “infinity customer”. I’m watching how social media is evolving and the more I learn the more I need to share. The most concerning thing is that when you build your audience on a social media platform like YouTube, Facebook or even Twitter… you don’t own that audience. Sure, you might not be concerned, but here’s how this affects you. When the company that owns the site changes their rules, you get affected. This happened a few years back when Facebook changed their rules and quit showing every post. One day your posts went to everyone on your list, the next day your posts were only appearing on only a handful of your follower’s feeds. This is a big problem. If you were relying on this traffic, it was all of a sudden gone! You need better control of your traffic. That is the best reason to create an Internet Marketing Machine. When the machine is cranking you are in control. You are developing relationships with your customers. You provide information they want to receive and you continue to add more people to your list. This constant attention really helps build the bond. Then at appropriate moments you offer items for sale. The purpose of the Infinity Marketing Machine is to create a list of your customers that you can build a relationship with via providing information. It is not going to work if it becomes a “buy, buy, buy” messaging system. Think about the best email lists you are on, they provide information, build a bond with you, and sell you items, but they don’t pressure you. You need to treat your customers the same way. Spend more emphasis on providing valuable information, the benefit of sales will follow! It starts with being consistent in your posting of content that your customers want! Here’s a Social Marketing Planner I created and have for sale on Etsy. Check it out! 2- Determine when you will post information for your customers. Be Consistent!